Launch day is here – and so are the first two full episodes of The Thoughtful Travel Podcast. I am beyond excited and yet also rather nervous to be releasing this baby into the wild! But I hope you’ll enjoy having me and my wonderful guests in your ears for twenty-five minutes or so each week (and more for this launch). I’m starting out with a fun one – the struggle of eating and ordering when you don’t speak the language. (Or in some cases, even when you do!) I’m guessing every reader also has had one of these kind of incidents – weird food showing up, or masses of miscommunication over a menu – so do let me know in the comments about your own “food in a foreign language” experience. Here is Episode 1 of The Thoughtful Travel Podcast! 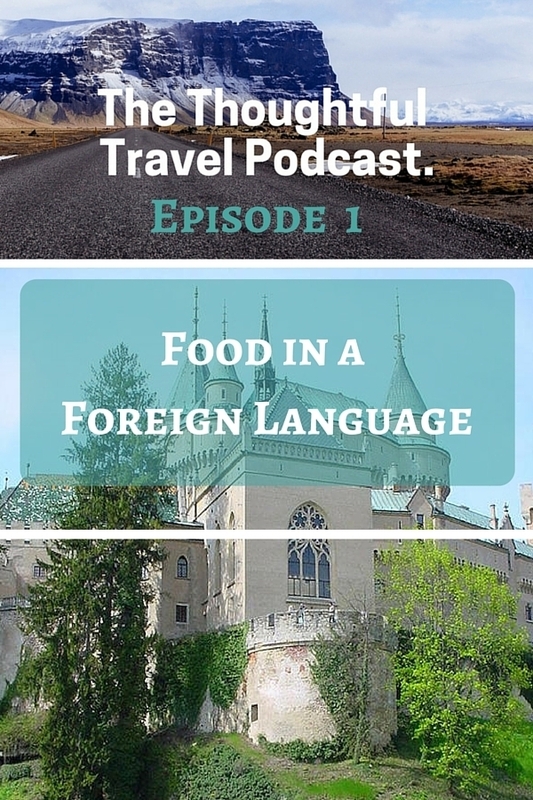 This episode has some great stories about both successes and failures when trying to get something to eat or drink in a country where English is not the first language (and one where it is!). Everybody who’s travelled has struggled with this situation many times, and I got to chat with several travellers who’ve had both fun and frustrations. In this episode, I talk with Linda and Craig Martin about their tricky experience trying to order red wine in Slovakia; Stephen Henson shares a friend’s tale about trying to ask a simple question at a Taco Bell store in China, along with some of his own mishaps (even in other English-speaking countries! ); and finally, Kristy Morton and I lament the difficulties she had ordering in a French patisserie as well as the lack of language learning that seems to take place in our home country of Australia. Wow! Sometimes it seems challenging to get the correct meal in your own hometown- let alone how tricky it would be to order a meal in a foreign country where a foreign language is spoken!! Yes you’re right Kat! Can be quite an adventure at times! Oh and so cool that this is your first ever podcast! I feel very honoured.